In this month’s Partner Profile, we spoke with Karlin Lamberto from the Pittsburgh Food Policy Council. Karlin is the PFPC’s Project manager and provides outreach, coordination and research support to the Council, the Urban Agriculture Working Group and related projects. She is driven professionally and personally by the central importance and implications of our food system on our families, our health and health of our planet. Thank you for taking the time to tell us more about the evolution of the PFPC and the incredible work you all are doing. 1. Give us your elevator pitch! 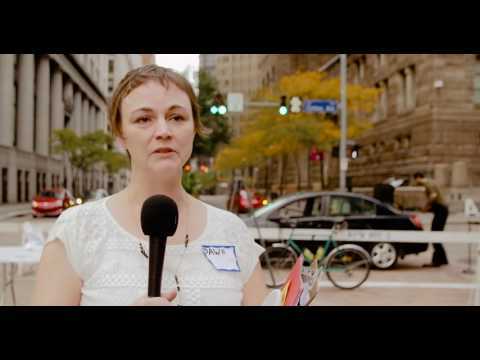 Why was Pittsburgh Food Policy Council formed? The Pittsburgh Food Policy Council was formed informally in 2009 by a handful of dedicated volunteers that worked across our local food system. Our intention was to come together across our particular organizational missions in order to understand a fuller picture of the food systems in our city and region by breaking down silos and coordinating efforts to improve the food system. As a Council we serve our members and the communities they live and work in across our region. We convene a multi-sector collective impact organization alongside nonprofits, businesses, government agencies, educational institutions and more. We focus much of our work with partners in in low food access communities. 3. What specific needs are you addressing? We address a variety of needs that are identified and prioritized by our working groups. For example, in our Urban Ag working group we address land access and soil contamination challenges and we facilitate growers’ access to training and workshop opportunities that contribute to the success of their projects. In the Food and Health Equity working group we address food access needs and those efforts have been primarily focused on youth (school food and summer meals) most recently. In our Regional Food Economy Working Group we prioritize institutional procurement, food system workforce issues and food businesses. In coordination with the working groups we are currently working on the Greater Pittsburgh Food Action Plan (GPFAP). The aim of the GPFAP is to provide a framework for common goals and actions that inform public policy and program development, facilitate community collaboration and participation in regional food system development. A thorough mapping of existing policies and strategies will help identify gaps, encourage collaboration and build accountability, while setting measurable short, medium and long-term goals for collective impact. 4. What is one thing that makes your organization stand out? In Pittsburgh we stand out for our approach to leadership. The PFPC draws on a broad and diverse leadership team of PFPC staff and members to design, lead, monitor and complete our work. With a unique blend of academic study, professional expertise and lived experience, we attract leaders who are committed to our collectively defined values and step forward to provide leadership in the service of our mission. 5. How has Pittsburgh Food Policy Council evolved over the years? Thanks to the support from local family foundations, in 2014 the Council hired Executive Director Dawn Plummer and (then) Outreach & Communications Coordinator Dora Walmsley. Those early years were spent developing the working groups, building a multi-sector network and establishing how our Council was going to function. Now that the Council is more developed and well supported by a larger staff and growing membership, we are able to be proactive and strategic about the projects that we undergo and dig deeper at the policy level. 6. Are there any organizations or individuals you look to as a role model in your work? Why? There are SO many! We often look to the Los Angeles Food Policy Council for their forward-thinking approaches and their many years of experience. Though our cities may be more dissimilar than alike, they’re like a big sister that we admire. We also look to Columbus and their Food Action Plan which brings together county and city level planning as we develop our own here in Pittsburgh. Our cities exist in the same general region and have similar demographics. As far as individuals go Anne Palmer at the Johns Hopkins Center For a Livable Future has been a tremendous resource for our Council. We deeply appreciate her willingness to provide guidance to our Council time and time again over the years. The Food Policy Network is a significant place of information for us. 1. How does Pittsburgh Food Policy Council partner with others to catalyze systems change? While our city and county have a history of supporting local food initiatives (i.e. community gardens and farms, healthy food initiatives, etc), these actions are not particularly well coordinated. Recognizing the systemic aspects of these issues, the Pittsburgh Food Policy Council convenes over 80 member entities in a growing ‘ecosystem’ of expertise, information, relationships, and resources. These entities come together in our working groups and at trainings to develop just, equitable and sustainable solutions to our food systems challenges. 1. What is 1 key to your organization’s success? Transparency. As we build our network, we intentionally seek to build trust-filled relationships. Transparency of information is key to building trust, mobilizing across sectors and systems. It also goes without saying that funding is very important. Without funding we would not have the human capital needed to create these collaborative spaces that advance our work. 2. Given what you know now, what are three things you wish you’d done differently as the organization developed? Perhaps when we first brought on staff, I think we should have given deeper consideration to the benefits and limitations of basing a Council at Extension. Our members soon hoped to take positions and advocate for policy, however as Extension employees and as an extension hosted program we were limited in our ability to meet these requests. People are our most valuable resource. If we were to do it all over, we would spend more time thinking about and implementing ways to further empower our membership. Relatedly, as a backbone organization, proper staffing levels really underpins our success. If we could do it all over, we would find to ways to support the hiring of additional staff sooner. 1. What is one of Pittsburgh Food Policy Council’s proudest achievements? Our network. With robust participation from our non-staff members, we are able to leverage expertise, leadership and perspective that has positioned us well to complete and implement our Food Action Plan. Relatedly, we are very proud of the Food Day Pittsburgh event we held in 2016. We closed down the street in front of Pittsburgh’s City-county Building and hosted a free meal for 350+ people from over 50 zip codes. 2. What is one challenge you’re facing right now? Anything your fellow FSLN members might be able to help with? In 2019, we seek to more deeply live our commitment to racial equity. We continue to struggle with how to best support the leadership and engagement of people of color within the context of a rather white nonprofit sector. Many active PFPC members are able to combine their contributions to our Council with their paid job responsibilities while others are not. We seek to find ways to make participation equally feasible for all of our members. 1. Any words of wisdom for fellow food systems leaders? Remember to communicate well with your network and to celebrate all victories--small and large--which will help your network stay motivated. Reflect your collective impact back to people so that they can SEE that their work is important. 2. Have you created any useful processes/resources that you’re particularly excited about? If so, please share! As boring as this might sounds, several FPCs have referred to our “Guiding Principles” document. We took over 7 months to put this together, laying out our structure and how we were going to do the work that we do. This year we are adding equity language and continue to tweak it but it is a good tool.